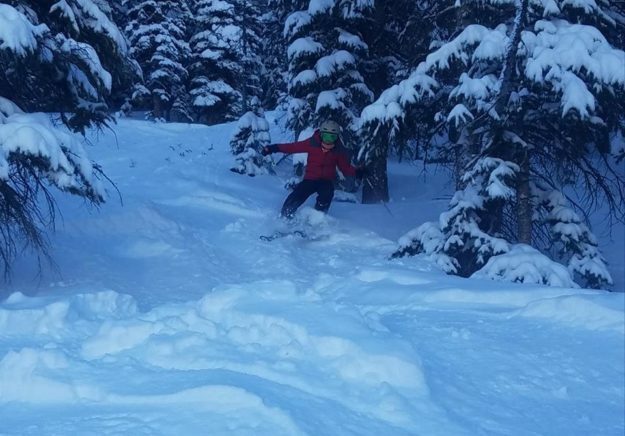 Rennick Williams found some deep, soft snow on Beaver Creek’s Falcon Park Sunday. After skiing a foot of powder at Beaver Creek on Sunday, I was looking forward to settling in and watching EagleVail’s Mikaela Shiffrin in her first event of the Pyeongchang Winter Olympics, only to find out the women’s giant slalom was postponed due to high winds. I flashed back to the Vancouver Winter Olympics in 2010, when five out of 10 medal events in alpine skiing were postponed for very different reasons. Warm, wet weather and generally mushy snow made those the most postponed alpine events in Winter Olympic history. As a writer for the Olympic News Service, I remember a lot of standing around in aqua raincoats waiting for the races to go off in Whistler. Of course, it was worth the wait as American alpine racers cleaned up there. Vail’s Lindsey Vonn won a gold and a bronze, and Bode Miller won gold, silver, bronze. Throw in another medal for Andrew Weibrecht, a couple more for Julia Mancuso, and it was the best showing ever by a U.S. alpine team with eight of the 30 medals awarded. But, oh, those weather delays. And now Shiffrin, the defending gold medalist in slalom and still just 22 years old, gets to kick off the Games with her best event. She’ll race slalom on Wednesday (Tuesday night here) and GS on Thursday (Wednesday night here). That’s right about when we should be getting our next shot of between 4-8 inches of new snow at Vail and Beaver Creek after around two feet of fresh snow in the last week. But let’s hope the weather has calmed down a bit by then in Korea. Pyeongchang, for very different reasons than Vancouver, is now oh-for-two, with the men’s downhill and women’s GS races both pushed back due to wind. Temperatures have not been a problem, with icy weather keeping things nice and frosty in northeastern South Korea. The only complaints I heard had to do with dust in the snow blowing in from the China’s Gobi Desert, making waxing difficult in the Nordic events. Wind was a factor in slopestyle snowboarding as well, with Silverthorne’s Red (short for Redmond) Gerard negotiating the gusty winds with a technically innovative final run to beat the blustery weather and a stacked veteran field for a gold medal. Fifth and seventh the last two years in Vail at the Burton U.S. Open Snowboarding Championships, let’s hope we get to see the 17-year-old in action here again March 5-10. Lake Tahoe’s Jamie Anderson survived a crazy windy slopestyle snowboard contest on Sunday that for some reason went off while the alpine GS was postponed. No knock on Anderson, the now two-time gold medalist in slopestyle, but the result was tarnished by the unfairly gusting conditions. And it was hammering snow and blowing hard at Bokwang Phoenix Park during the women’s moguls Sunday, when Vail’s Tess Johnson rallied big-time to make it into the medal round. The 17-year-old didn’t make the super-final (in fact, no Americans did), but she wound up 12th overall in her Olympic debut. That is impressive, and clearly she’ll be back and continuing Vail’s bump-skiing tradition for the 2022 Games in Beijing, China — and who knows, maybe 2030 on home snow in Colorado? One of my Olympic News Service highlights was covering Vail’s Toby Dawson as he earned a bronze medal in moguls in Italy in 2006. Great story by former Vail Daily editor Ed Stoner catching up with Dawson — now coaching the Korean team. What if the Olympics were this week in Beaver Creek — a resort meant to host alpine events at the 1976 Denver Olympics that were scrapped over funding? Saturday would have been a wash, with massive snow likely scrubbing any races. But overall, we’d be able to pull off the Games with a minimum of postponements. Yes, there have been cancellations of World Cup events here in the past due to a lack of snow. But those have been in November or early December. We would never scrap a race here in February because of no snow. We might have the opposite problem, with too much snow falling for speed events in alpine. Even in the midst of one of the lowest snow seasons in the last 30 years, both Vail and Beaver Creek are now skiing great, with multiple powder days over the last several weeks. Great to mix good snow locally with Olympic enthusiasm globally. The women’s slalom is scheduled for Wednesday, with a first run start time of 10:15 a.m., Korea Time (KT) / 8:15 p.m. EST Tuesday. The second run is scheduled for 1:45 p.m. KT / 11:45 p.m. EST Tuesday. The women’s giant slalom is now scheduled for Thursday with a first run start time of 9:30 a.m. KT / 7:30 p.m. EST Wednesday. The second run is scheduled for 1:15 p.m. KT / 11:15 p.m. EST Wednesday. The men’s downhill is also scheduled for Thursday with an 11:00 a.m. KT start time – 9:00 p.m. EST Wednesday.